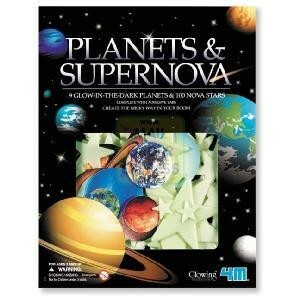 Glow Planets and Stars Supernova (100 pieces) - spacekids - space toys, dressing up costumes, kids spacesuits, astronaut food, cool space stuff! Create a universe in your room! A comprehensive pack of planets and stars to decorate your room. Contains the sun, and the 8 planets of the solar system, along with 100 stars, complete with adhesive tapes. Decorate your room, expose the glow shapes to light for a minute, then turn off the lights and let them glow. A fun and educational product, approved by the Science Museum, London.